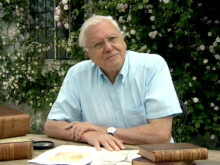 On Sunday, May 8, the amazing David Attenborough will turn 90 years old. He is the original nature documentary filmmaker who pioneered and practically invented the genre with a multitude of programs and series spanning over sixty years of broadcasting not only in England, but all over the world. His unmistakeable voiceovers, always written by himself, gives countless documentaries something very special even if he does not appear in person while his own documentaries are always even more fascinating, showing his own boundless sense of wonder and enthusiasm. The BBC has a modest birthday program for David Attenborough with some specially selected archival documentaries, a new hour-long interview program and a new one-off documentary. BBC2 screens Attenborough’s Passion Project on Satuday, May 7 starting at 18:30 (all times UK) with the two reruns A Blank on the Map from 1971 and The Lost Gods of Easter Island from 2000 which are both available on DVD in the collection Attenborough in Paradise and Other Personal Voyages. On Sunday, May 8, BBC1 starts with a re-run of the recent Attenborough and the Giant Dinosaur at 16:35 with the interview special Attenborough at 90 following at 19:00 GMT. The new documentary Attenborough’s Life that Glows is then shown on Monday, May 9 on BBC2 at 21:00. On Tuesday, May 10 at 23:00, BBC4 will be showing a rerun of the 2012 Natural World Special Attenborough’s Ark and Saturday, May 14 brings a second part of Attenborough’s Passion Project on BBC2 starting at 18:30 with one episode from the Lost Worlds, Vanished Lives from 1989 and Charles Darwin and the Tree of Life from 2009. Tuesday, May 17 has the most interesting program of them all: BBC4 will be showing the 90-minute documentary David Attenborough’s Zoo Quest in Colour starting at 21:00. Recently, it was discovered that some of the surviving 16mm footage from his early Zoo Quest series was actually filmed in colour, but only printed and broadcast in black and white – this program will showcase this discovery with Attenborough and his camera man Charles Lague remembering their first foray into documentary filmmaking in the 1950s. This seems to be all the BBC has to offer, but wait – Aardman has made two wonderful Creature Comforts specials which are on Youtube as Lyrebird Meets Attenborough and Penguins Meet Attenborough – Happy Birthday!